It's 20:23 in Twin Bridges, USA right now. Sierra-at-Tahoe Ski Resort Lots of webcams in the Sierra-at-Tahoe Ski Resort. 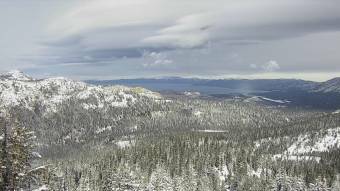 South Lake Tahoe, California: Heavenly Mountain Resort, 11.3 miles away. South Lake Tahoe, California: Ski Run Boulevard, 11.3 miles away. Tahoe City, California: SR-28 / Fanny Bridge, 23.5 miles away. Bear Valley, California: Snow Gauge, 24.4 miles away. Squaw Valley, California: Squaw Valley Road, 27.3 miles away. Kings Beach, California: Beachview, 29.9 miles away. Northstar California Resort: Current Snow Conditions, 32 miles away. Incline Village, Nevada: Diamond Peak Ski Resort, 32.6 miles away.